United Airlines is possibly showing flights from Vancouver to Sydney, Australia for $775 CAD roundtrip including taxes. I have also seen a few flights from Vancouver to Melbourne, Australia (MEL) for $761 CAD roundtrip including taxes, but only in November. Some dates have 1 stop on the way there, and 2 on the way back. Some have 1 stop each way. To Sydney, you would probably still be better off to book the non-stop flights with Air Canada that have been available lately for $935 CAD roundtrip including taxes. Or the 1-stop Qantas flights for a similar price. The 1-stop flights to Melbourne might be more attractive, since a minimum of 1-stop is always required to get from Vancouver to Melbourne anyways. But it's hard not to point out what would be the cheapest flights ever from Vancouver to Australia, even if they are on United. Update 6/27 @ 7:20 AM PST - Checking this morning, these are showing up for $775 CAD roundtrip on Momondo, but the price now jumps to $829 when you verify them on Fareboom. 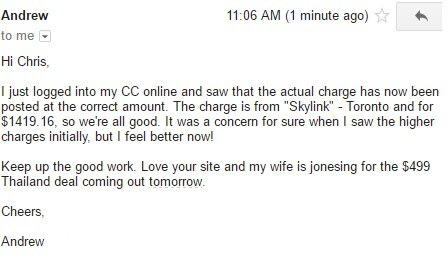 Update @ 6 PM PST - I have heard from 2 different people who said that they were charged a higher amount by ExploreTrip than what was shown on the verified price page. I'm going to remove this update for now. Update 7/10 @ 10 AM EST - A few people who booked these have been in touch with ExploreTrip. ExploreTrip explained that the pending charge on their card is higher, but when the charge actually posts in a few days, it will be the correct price that they booked at. These are still showing up on ExploreTrip today, so I have re-added the update to the blog post. 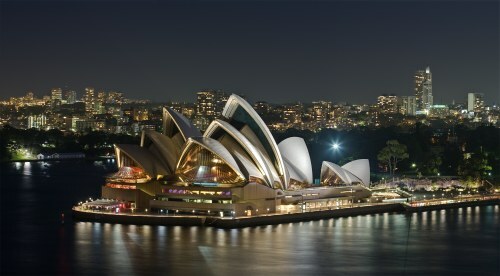 vancouver, yvr, flight deals, united airlines, australasia, australia, sydney, syd, melbourne, mel and oceania. 5 Responses to "Vancouver to Sydney or Melbourne, Australia - $692 to $775 CAD roundtrip including taxes"
In America, nobody beats United. In Red America, United beats you! Over the past 20 years I have flown between western Canada and Sydney, mostly on United because it was the cheapest, and after crowded, hot, dirty, cramped planes I vowed never to fly United again. For a few hundred dollars more, the better and newer planes, and definitely superior service, of Qantas, Air New Zealand, and Air Canada are well worth it. Emma, you just need to follow the instructions in the blog post. Australia does require a visa, but it's only $20 for Canadians, and really easy to get online. Google 'Australia e-visa' and the first result should be the .au government website where you can buy it.